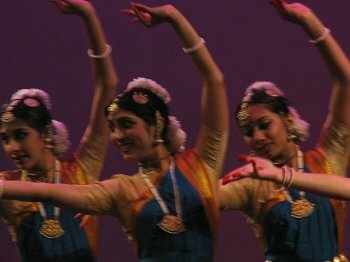 On Sunday, June 8, 2008, I attended Samskriti Foundation's dance production titled 'Vanamaali - the one they loved,' at Pfeiffer Hall, North Central College, Naperville, IL. I was excited to watch this program as the presentation included three different dance forms: Bharatanatyam, Odissi and Kathak. The presentation began with an invocation of Lord Krishna with Sanskrit verses from Krishna Karnamritham danced by dancers from all the three disciplines. This was followed by a piece in which the dancers praised Lord Krishna's personality in the Tamil song "Nanda Nandana Gopala." 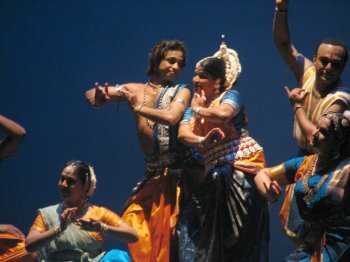 Shoba Natarajan played the role of Andaal, a 10th century poet in this production. Through Bharatanatyam, she brought to life the character of Andaal, who expressed her love towards the Lord by singing and dancing "Kanaa Kandein Thozhi Naan" (I dreamt of Him, dear friend), a beautiful Tamil pallavi in raagams Ananda Bhairavi and Ameer Kalyani. Andaal, along with her friends (or Sakhis) played by Sangita Rangala and Sai Patil, took me to the banks of a river in South India, engrossed me in their conversations, and finally as they walked towards the temple in a procession accompanied by playing of temple instrument (Thavil), they carried me along. As Andaal entered the temple, I followed, along with the 400 others who had a feeling of walking behind the Lord in Garuda Sevai procession during Vaikunda Ekadasi. Such is the power of the storytelling of the Bharatanatyam team that they carried the audience along with their beauty, grace, and power. The portrayal of character Andaal demanded presentation of Bhakti or devotion, and Sringara - the expression of love, in a physical and spiritual sense. Shoba Natarajan's training, experience, and attention to detail was quite evident in her powerful abhinaya and her ability to engage the audience in her conversations with the Lord, as she meticulously executed each expression and movement, be it trying out the garland placed in front of Lord, or declaration of taking her life if she has to marry a human. From Invocation to Andaal's union with the deity of Srirangam, the Bharatanatyam presentation had the wonderful support of the talented and accomplished dancers - Vinod Menon, Sangita Rangala, Sai Patil, Ranjani Raghunathan, Sailahari Ponnaluri, Jyotsna Dhar and Saloni Buch. Vasudha Ravi's soulful rendition of Andaal's pasuram, "Male Mani vanna", in raagam KunthalavarAli, which is one of the many pasurams she recited, was filled with Bhakti and lot of emotions, and brought me closer to God. I truly fell in love with her voice. She is a gifted singer. Rajkumar Bharathi's compositions had a lot of depth and meaning. The Odissi presentation started with the ensemble dancing to the beats of Mardhala by Sachidananda Das. This opening piece explored different complexities of rhythm, for which the dancers executed their footwork with utmost precision. They displayed immense sense of timing, better co-ordination, perfect symmetry in use of space, and needless to mention the brilliant visual appeal they created with the costumes designed in red, green and yellow colors. Ipsita Satpathy from Utkalaa Center for Odissi Dance, played the role of Radha, who was the principal paramour of Krishna as described in Srimad Bhagavatham. She conversed with her close friend, Lalitha (played by Sangita Rangala), and her other friends played by Ankita Khandai, Sunameeka Panigrahy, Bindula Sinha, Priya Barua and Ananya Dev. The presentation was filled with thoughts of separation, longing for her Lord Krishna, and most importantly the emotional break down upon hearing of Krishna's infidelity. The emotional roller-coaster was brilliantly portrayed through her subtle abhinaya, the reaction of her friends during her dialogue, and the beauty and grace of Odissi's stances, especially the Tribhanga (triple bend of the body - like the curve of English alphabet S) which conveys the nurturing and soft nature of the presenter. In contrast to the Bharatanatyam presentation, which took me to Vaikundam (heaven), this presentation brought me to the earth and filled me with thoughts of melancholy, as the dancer portrayed range of emotions such as separation, jealousy, longing, envy and finally, when the dancer threw the garland with rage, I got scared. No kidding. I sympathized for Lord Krishna for the mess he had created for himself. Poor guy. The last thing he could do at that moment was to stand in the way of Ipsita Satpathy as she walked out of stage. Such is the story-telling power of the Odissi presentation, and the powerful feminine emotions through which the story was conveyed. This presentation illustrated the devotion of Meera (played by Kiran Chouhan of Anila Sinha Foundation) through Kathak dance form. Meera was a 15th century poetess, who sang bhajans on Lord Krishna and it is believed that she united with Lord Krishna when she disappeared in a temple of Krishna. The main dancer was supported by Sunil Sunkara, Gurmeet Kour, Richa Gupta, Medha Srivastava, Manju Manwal and Roshni Sharma in this narration of Meera's life, who, inspite of her marriage to Rana, was always engrossed in thoughts about Lord Krishna. Dancing to the beats of Subhash Nirvan's tabla, the dancers mesmerized the audience with their high speed footwork (tatkar) and spins (chakkars). Dancer Kiran Chouhan's portrayal of Meera was one of the best performances of the evening. The presentation by the team was a pure delight to watch. I drove all the way from Cincinnati to Chicago, just to watch this unique rapid-fire 3 min Thillana in ragam Brindavana Saranga. When you have a talented young dancer named Sai Patil (a student of Viji Prakash from Los Angeles) who danced in perfect araimandi, and 3 young dancers trained by Shoba Natarajan in the team, blessed with a great sense to use space and time, wearing beautiful blue outfits, the outcome is nothing short of a stunning dance presentation with brilliantly executed footwork in different Nadais (Misram, and Tisram). As they left the stage, I felt that they should have danced more. 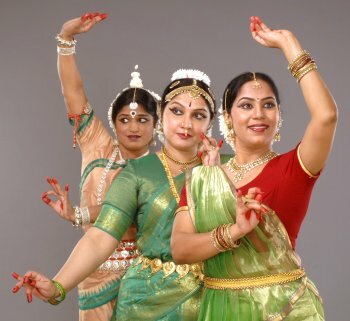 But that is the uniqueness of this Thillana, which was intended to portray the brilliance and beauty of Bharatanatyam's Nritta component in a short time. This Thillana to me, was a 3 minute love affair with rhythm and precise footwork. But just like anything beautiful in this transitory nature of life, it has to come to an end, only to give birth to another mind-boggling piece containing panchajathis (tisram, chadhusram, kandam, misram and sankeernam) called 'Shuddha Nritta,' a purely instrumental piece composed by versatile mridangist G Vijayaraghavan, danced by Shoba Natarajan and Vinod Menon (Bharatanatyam), Ipsita Satpathy and Odissi maestro Manoranjan Pradhan (Odissi) and Kiran Chauhan and Sunil Sunkara (Kathak). In conclusion, watching 'Vanamaali-the one they loved' was a transcendental experience. The production was filled with floods of emotions such as bhakti, shringara, separation, longing, envy, rage, and unconditional surrender, as Jivaathma (mortal souls) tried to unite with Paramaathma (the Lord). The production was able to relate to the audience from different backgrounds. Twisha Shah-Brandenburg, an audience member said, "I have seen many performances but Vanamaali was by far one of the best in aesthetics and dance styles." As I looked beyond Shoba Natarajan's powerful abhinaya and Odissi dancers' brilliant costumes, and Kathak dancers' breath-taking chakkars, the Lord was there, on the stage. Vanamaali, the one who wears the garland of wild flowers that never withers, descended on the stage when Andaal walked into the temple, and when Radha threw the garland with rage, and when Meera surrendered unconditionally to Him. On surface, it may appear to be Samskriti's tireless effort to bring this unique idea to stage through 24 talented dancers and as many musicians, and stunning visual effects, after working day and night for past few months. But it was Lord Krishna's grace and omnipresence that made this premiere a wonderful evening to remember. Hari OM !! Kalyan Shencottah's primary interest is in Mridangam. He is also trained in Carnatic music, Tae-kwon-do, Modern dance, Ballroom and Bharatanatyam. A graduate from University of Cincinnati, he works as a SAP Basis administrator in Cincinnati, OH.